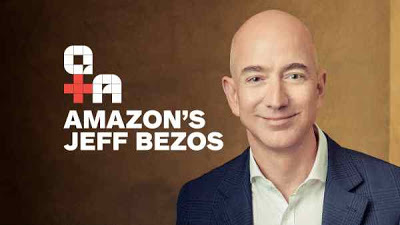 Amazon CEO Jeff Bezos Become sWorld’s Richest Man Surpasses Bill Gates. According to Bloomberg, surge in Amazon.com Inc. shares Thursday morning in advance of the online retailer’s earnings report has propelled founder Jeff Bezos past Bill Gates as the world’s richest person. Founder on internet retail behemoth, Jeff Bezos has surpassed Microsoft founder, Bill Gates to become the world’s richest man. Gates has held the position of World’s richest man since 2013 on the Bloomberg Billionaires Index. Shares of the online retailer rose 1.3 percent to $1,065.92 at 10:10 a.m. in New York, giving Bezos a net worth of $90.9 billion, versus $90.7 billion for Gates. If that holds through the 4 p.m. close, Bezos, 53, will leapfrog Gates, the Microsoft Corp. co-founder, on the Bloomberg Billionaires Index. Gates, 61, has held the top spot since May 2013. Amazon is expected to post quarterly revenue of $37.2 billion, a 22 percent jump from a year earlier, according to the average estimate of 34 analysts surveyed by Bloomberg, and earnings per share of $1.42.